The question with Joe Lutcher always remains the same each time we meet him – will he justify his ongoing inclusion in the roll call of rock artists? It’s never a sure thing. Yet that ongoing doubt as to his legitimacy for a roster spot is not entirely fair either because it was Lutcher, as much as anyone really, who foretold of rock’s emergence months before it actually came into being. When he tried to implement his ideas those efforts were largely thwarted by events out of his control and when others came along who perfected the formula he’d only tentatively worked out in theory he found himself somewhat left behind as they took hold of it in ways that he hadn’t envisioned, both more explosive and more commercial, the combination of which largely relegated Lutcher to long-term obscurity. So instead of being at the forefront of a movement soon poised to take over western civilization he was left on his own to venture down dimly lit paths on the outskirts of the region to little acclaim and recognition. It’s easy now to envision Joe Lutcher like a half-crazed prophet babbling about mystical events around the corner back in the spring of 1947 which nobody paid much mind to at the time. If he hadn’t been the brother of popular pianist Nellie Lutcher who’s to say that instead of being offered a recording contract by Specialty Records, surely seeking to capitalize on the name if nothing else, he wouldn’t have been locked up for his predictions of a musical revolution? So at least he got his chance to expose the world to this cockamamie idea. But while Lutcher may have sensed the changes on the horizon he proved how frustratingly tantalizing those sounds could be if you were unable to harness and control them, and most crucially if you weren’t able to distill them down to something usable in the process. His early efforts for Specialty, including the ominously titled Rockin’ Boogie couldn’t quite corral the specific attributes needed to – for lack of a better term – INVENT rock ‘n’ roll. Instead he merely presaged it in a rather vague way. But the mere title itself was potent enough – and the music contained within was close enough to the real deal – for that record to score with audiences months later after Roy Brown had indeed perfected the formula, or rather had finally been afforded the opportunity to put it on wax after Brown himself had first conjured it up on stage more than a year before even Lutcher’s initial forays into similarly uncharted territories. Lutcher therefore was playing catch up from there on in, his instincts far outstripping his execution when it came to conveying the sounds swirling around him. In fact Lutcher’s work to date, while not comfortable in any field other than rock, was decidedly on the far outskirts of rock, sometimes veering close to slipping away entirely. At one point in the review for Shuffle Woogie I went so far as to say he may have been the last one to make the squad. But he was never in danger of being excised completely – no matter how close to the edge of the style he strayed prior to this – and these later forays for Modern Records are the reason for that. Songs like Rock-Ola showed that he wasn’t completely destined to remain a visionary whose ideas came to fruition for somebody else. Rock music’s primary means for exposure in the early days wasn’t the radio, it was the jukebox. A far more democratic method of determining hits actually since there was no disc jockey or program director choosing which records to play. Instead that was left to the consumer themselves, their hard-earned nickels being deposited for the songs that stirred their interest the most and made them want to hear it again and again. Jukeboxes were located in many of the settings that formed the rock fan’s social scene. Bars, clubs, drug stores and greasy spoons, the music offered on these machines often had as much to do with luring in customers as did whatever products the establishments were selling. Thus with just 25 or so slots available for the latest records the competition was stiff to earn a place on each box and once there it had to keep “pulling coin” as the term was in order to keep that spot. One look at the dominant models tells you that the jukebox was a decidedly mid-twentieth century apparatus in design. The electronic aspects were a reflection of its modernity, while the aesthetic qualities were a portend of the future as imagined by a nation increasingly drawn towards space age flashiness. There were three primary jukebox manufacturers at the time. 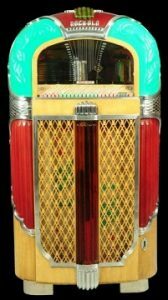 Wurlitzer, Seeburg and Rock-ola, which featured the Magic Glo model you see here which was as colorful as anything outside of an acid trip (which itself wasn’t even invented yet!). I don’t care how much better digital music heard over high-end audio equipment sounds today, there is no doubt that listening to music coming out of THESE contraptions is a far cooler proposition. 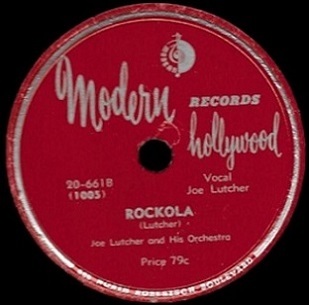 There can be little doubt that Lutcher was attempting to somehow forge a connection between himself, this record and the company that may be stocking it, but the thing is the Rock-Ola company themselves weren’t the ones choosing which records were placed in their jukeboxes. That was the job of the record distributor who worked for record companies and attempted to sell their product to the proprietors in their specific region. On one hand these distributors were the unsung heroes of rock ‘n’ roll, their ability to push product was often the difference between a hit and a flop, but on the other hand the job itself was a sleazy one at its core, leading to corruption, payola and other dirty facts-of-life that ultimately helped to drag rock’s image even further down into the gutter. 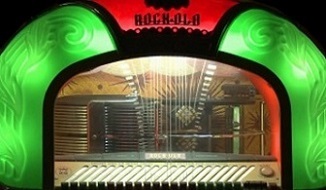 But while Lutcher’s decision to name the song Rock-Ola (or Rockola as it’s shown on the label) may have shown little awareness of just how these things operated, and may have even led to owners of establishments with a Seeburg or Wurlitzer model refusing to take the record out of some sense of bizarre loyalty, at the same time it provided an incentive for those who DID use Rock-Ola brand jukeboxes to take a chance on his record if nothing else. A gimmick for sure, but not one without some potential benefit for both the owner of the jukebox and Lutcher himself. Of course it would help if the song itself was worth the trouble and as his previous efforts in the rock field were decidedly lacking that regard that means this record’s prospects are no sure thing. The problem he’s had thus far in connecting with the rock audience can be boiled down to the fact that Lutcher had come of age in an earlier time with different musical sensibilities and though he certainly was among the first to grasp the basic concept of rock as a music centered around building and sustaining excitement he was often hampered by the means of doing so, as he tried conveying that pandemonium with instruments and arrangements not too far removed from a more sedate era. That’s the case here as well – to a degree – but the events of the past year, most notably the successful rock songs that better grasped the formula he’d been toying with for awhile, have finally seemed to sink in with him. The record starts strong by unloading its arsenal on the senses, horns riffing in unison while the drummer keeps up an unrelenting beat. When Lutcher’s sax takes center stage he’s playing in a thoroughly modern style, not quite as gritty as the best sides, but then again he wasn’t the best musician to be found among the horn blowers of rock’s first era to begin with. He was a passable alto player, capable but hardly scintillating. His commitment though isn’t lacking and as a result, even if you were shying away from him thanks to the underwhelming sides he’d issued before this, once the riffs begin you find yourself pulled in, your optimism growing with each refrain. Had he stuck the tried and true instrumental formula, one that propelled rock into the commercial stratosphere initially and one that was still reaping benefits more than a year later, Rock-Ola might’ve been truly special. Instead Lutcher sets his own horn aside and attempts to remind you that he also sang. Not sang well mind you, but unlike most sax players he was a frequent vocalist and surely seeing a chance to double-down on the potential appeal to store owners whose Rock-Ola jukeboxes might have an opening for a record, Joe starts frantically repeating the title while the trumpet (again, it has to be mentioned, the most outdated instrument of the horn section) provides the primary backup to his off-key chanting. It’s not effective in the least. In fact it’s rather annoying. First off there’s no melody he’s carrying with his so-called singing and if he were trying to carry one he dropped it well before he reached the microphone. There’s also no story he’s conveying which in vocal songs tend to be a basic requirement of the lyrics. But then again there aren’t any sensible lyrics, not really anyway, just the title repeated until you want to pull the plug on the record and the jukebox itself. But wait a minute… didn’t I say earlier in the review that this record was the one that ensured his place in the rock neighborhood wasn’t subject to eviction? Yes I did and here’s why. That refrain, as gawdawful as it is, takes up just a small part of the record. Though technically not an instrumental because of its inclusion, in every other way it IS an instrumental and not a bad one at that. The remainder of the record is all horns, the tenor getting its spot to solo coming out of the final vocal break, and with the piano and drums carrying the rhythm the whole time it holds up pretty well. At the very least the churning riff they play throughout is catchy enough to deposit a nickel in the jukebox in order to hear. It’s well constructed, frantic without being out of control, giving space to each of the horns – yes, including the trumpet, which probably goes without saying is the weakest part – to strut their stuff. The later vocal chanting that’s thrown in works far better than the first time around because it’s not Joe doing it, but rather the whole band in unison and they’re delivering it in a stop-time staccato yell, the pauses emphasized by the drums which makes it actually sound more like a threat than a humorously drunken bellow like Joe’s refrains had been. Now all of this is not to say that Rock-Ola is a 100% pure rock jam of the highest order, far from it actually, but it’s at least workable. His biggest flaw as an artist was the fact, for all of his predictive qualities regarding its arrival and ultimate success, he never seemed able to concentrate on delivering only the key attributes of rock and rock alone. The guy just had a lot of diverse musical ideas running through his head and they often came out in a jumbled heap. Whereas other musicians, not to mention arrangers and producers with a firmer hand than those overseeing his sessions ever seemed to be blessed with, would excise the dross in order to streamline a sound and allow it to conform to one genre classification, Lutcher had no such self-editing qualities. He seemed to let all of those ideas frolic together even if they frequently clashed. Here it doesn’t quite clash but the aforementioned trumpet gets used too liberally, getting a second standalone spot towards the end which goes on far too long and soon is careening into a squealing helium-filled coda. But truthfully all of the horns by this point are piling on top of one another and so it doesn’t sound completely out of place or anything, the energy never lags that’s for sure, and you’re pretty well caught up in the excitement they lay down. However when assessed structurally the record would’ve been improved had they shifted the load to the three sax players which get off some great lines along the way that simply aren’t emphasized enough to make them stand out the way they should. None of this – the trumpet or Joe’s earlier ill-advised vocals – are enough to sink the record entirely. It’s an average, though hardly typical, rock instrumental for the time – or quasi-instrumental if you want to be picky about it – but because of the inherent stylistic conflicts it never has a chance to be truly great. Designating a record as “average” however is hardly an criticism, they are what establish the baseline for the rest of the field to work off of and so in that regard Rock-Ola was at least something of a validation of Lutcher’s original vision. A sign that he did fit into the program and a record which he can be modestly proud of and help to keep the bouncers in rock’s increasingly crowded club from tossing him out on suspicions of being an interloper. Yet in the final tally it also serves as evidence as to why Joe Lutcher was never going to be among rock’s biggest stars, for even when he named the song after one of rock’s most effective means of dispersal and aligned it with the name of the music itself in the process, he was still being pulled at by other musical forces and if there’s one thing rock tends to insist upon it’s the utter devotion of its greatest practitioners. Leave a reply on "Joe Lutcher: “Rock-ola”"